Tampa knows how to party, especially during the holidays. Check out our list of the best New Year's Eve parties in Tampa and ring in the New Year the right way! The hottest New Year’s Eve party in Tampa is at Club Prana! Celebrate New Year's Eve 2019 with a bang at the most exclusive party in town! This party promises five levels of non-stop fun at Tampa's hottest nightclub. Club Prana in Ybor is notorious for throwing the hottest dance party in town, and they're preparing a New Year's Eve party to be even better than ever! The Fifth Annual New Year’s Eve Premiere 2019 at Aloft Tampa Downtown Hotel promises a great night of dancing, music, and fun! Ticket price includes awesome fireworks with a view of Downtown Tampa and the Tampa Riverwalk plus a fire-breathing and dance performance by Fire Fly Flow. VIP tickets include open bar and appetizer buffet, and, this year, a new general admission ticket with a cash bar lets you enjoy all the festivities at this cool hotel venue in the heart of Tampa. Extra, extra! Countdown to 2019 with MARIO LOPEZ as Pied Piper's 15th annual New Year's Eve Party and fireworks! This annual New Year's event in Tampa has changed location and amped up the volume as they feature celeb Mario Lopez (Extra!, Saved by the Bell), DJ Magic Mike, and LeSage. Watch fireworks at The Godfrey Hotel over they Bay from Tampa's only dual-barge fireworks display. Head to Armature Works for the most exclusive yet inclusive party in all of Tampa where everyone is a VIP! Hang out on the lawn at midnight as an elaborate display of fireworks goes off with the city in the background. Tickets include an all-night premium open bar with a wide variety of beer, liquor, wine, and champagne options. It will be a night to remember with entertainment by a DJ as well as a live band. The countdown to New Year's Eve 2019 is on! Purchase your tickets today for Jackson’s New Year's Eve 21st Anniversary Celebration. 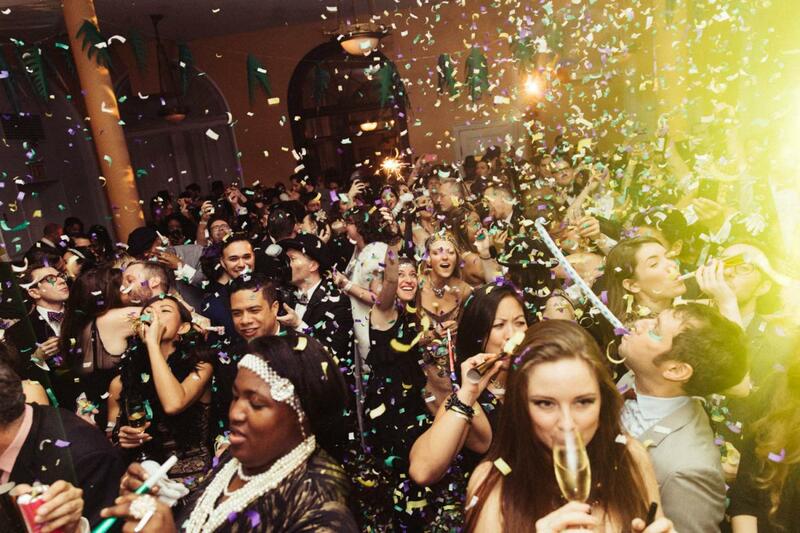 All party-goers at Jackson’s New Year’s Eve party will receive a complimentary glass of champagne for your midnight toast as well as party favors so you can be all set for the balloon drop at midnight! Chill out at Skipper's Smokehouse and enjoy a New Year's party with Donna the Buffalo & Western Centuries. Advance tickets are just $35, and you'll be jammin' to cool tunes as well as enjoying great food and music under the stars on their laid-back outdoor patio. Enjoy five-star dining, craft cocktails, great music, and no-hassle fine dining on New Year’s Eve at Eddie V's Prime Seafood in Tampa. The food will be outstanding, and Eddie V's always delivers with the best music year-round; they're playing until 12:30 a.m. for the holiday! There will also be a midnight toast and complimentary dessert bar with crème brulee, chocolate truffles, cookies and panna cotta. From 8:3 p.m. to 3:00 a.m., this jam-packed event has dinner, premium open bar, and breakfast included with the ticket price. Ciro's Speakeasy and Supper Club invites you to a "For Your Eyes Only" New Year's Eve Masquerade party to remember! There will be an open bar, a raw bar, h'ors d'oeurves, live burlesque dancers, and more special performances throughout the night! An open bar all night long! When we say open bar, we mean open bar. Treat yourself to any and all of the liquor, beer, and wine that we normally have available, including our top shelf selections! An endless supply of, appetizers, pizza, wings, and salads for your consumption running all the way until 11pm! Join them for a champagne toast at midnight, because what's New Year's Eve without champagne? This is the absolute best value in Tampa for New Years Eve. You will not want to miss out! Tickets are very limited and will sell very quickly, so get them now before they are gone! With incredible music, food, and fireworks, the New Year's Eve parties in Tampa only present one problem: which one will you go to? Let us know in the comments below, and have a happy New Year!